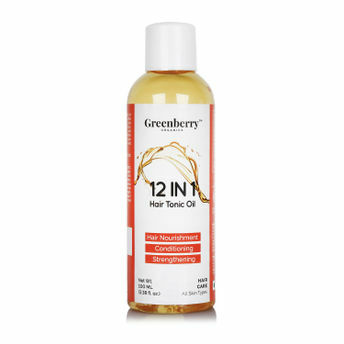 Greenberry Organics 12 IN 1 Hair Tonic Oil is a complete remedy to Shiny, Thick and Nourished hair. With the goodness of 12 powerful oils and natural ingredients like Sea buckthorn Oil, Jojoba Oil, Indian Gooseberry Oil and Muru Muru Butter, this Hair Tonic Oil ensures to keep a check on dandruff, dry scalp, dry and damaged hair as well as provides nourishment and conditioning to hair. A tonic oil with the blend of nature's finest 12 oils and extract. Argan Oil: A Tremendous boon for the scalp. Rich in natural phenols that helps hair follicles. Liquid gold. Sesame Oil: Rich in multiple vital nutrients it promotes hair growth, treats premature greying and protects hair from harmful UV rays. Almond Oil: Rich Omega 3 fatty acids and magnesium, it treats damaged hair, nourishes and strengthens them. Olive Oil: A lightweight emollient with excellent nourishing and conditioning properties. Sea buckthorn Oil: All natural fruit oil rich in Omega 3,6,7 & 9. It helps in reintegrating cells process and tackles premature hair loss. MuruMuru Butter: It contains 7 essential amino acids which are a natural powerhouse. The butter contains natural hydrating and moisturizing compounds called saponins, which nourish and protect hair. Jojoba Oil: One of the few oils which have the capability of moisturizing the hair and its follicles without leaving any residue behind. Indian Gooseberry Oil: An age-old remedy from Ancient Ayurveda, Amla is considered to have all the super nutrients and essential fatty acids to strengthen the hair follicles and nourish them. Fenugreek Seed Oil: A natural solution to dandruff, it reduces itchiness on the scalp. Rosemary Oil: A wonder oil that has been claimed facilitates hair growth, treats dandruff and scalp allergies. Spearmint Oil: A natural cooling menthol effect that treats itchiness, dandruff and heals the scalp from any bacterial infections. Vitamin E Oil: Helps in repairing and building new tissues on the scalp. Encourages hair growth by reducing scalp inflammation. Greenberry Products are: 100% vegan and free from Parabens, Silicones, Alcohol, DEA/TEA, Artificial Fillers, Mineral Oils, Phosphates, Paraffin Wax, Phthalates, Petrochemicals & Synthetic Colors.